In some cases - possibly depending upon seriousness of offense - Google Legal appears to only want us to report the URL of a problem blog. In the past, we would advise providing details of offense, when reporting. Previously, we would advise providing details, to identify specific offense - or where the offense is present, in the blog. This appears to be no longer relevant, in some form entries. Be very very specific why you believe that they should be legally required to remove, or edit the content of, the blog in question. With some offenses being reported currently, only the blog URL is requested. Detail of offense, with some problem blogs, now appears to be a matter for Google to identify, on their own. Possibly, this encourages us to only reports problems which are blatantly obvious. If the offense, in a problem blog, is subtle, it may not be relevant to them. In some cases, what is offensive to us may not be legally actionable for Google. In some cases, an offended person may have to take legal action, on their own. If you report a problem blog, using the appropriate form, and you wait patiently - and no action is taken - you may have to take action on your own. This is where you hire a lawyer - and get a court order from a sitting judge, that supports your needs. Then, you must submit your court order, properly. 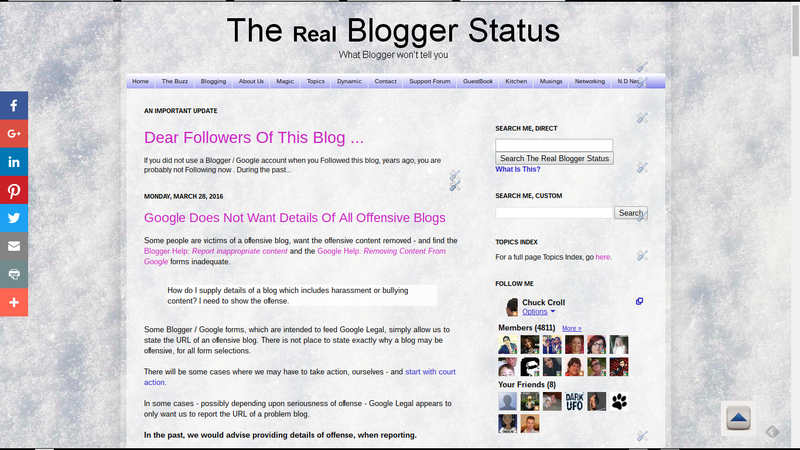 All offensive #Blogger blogs do not appear to require the same level of detail, when reported to Blogger / Google. In some cases, we can only report a blog URL - and Google Legal will take it from there.